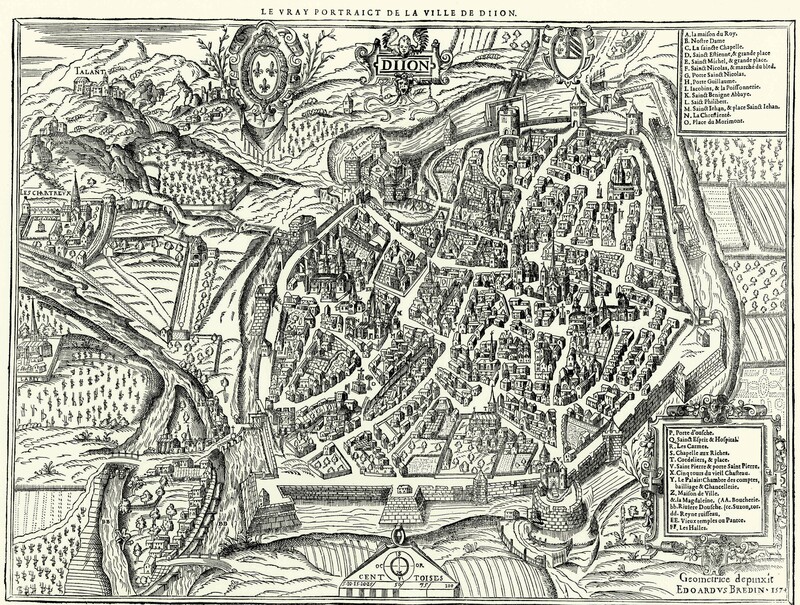 Figure 1: Map of Dijon 1574. Edouard Bredin. Archives municipales de Dijon, cote 4, Fi 956. In 1413 Jean Aubert, resident of Dijon faced what many would consider to be their worst nightmare: both the untimely death of his spouse and a fiscal evaluation of his marital household. Then, as now, any emotional upheaval had to give way to an impersonal process, the drawing up of an inventory cataloguing and valuing household objects. Such a process may well have been made all the more distressing by the presence of witnesses in the form of heritors and neighbours and from watching objects with emotional attachments being reduced to mere numbers. The only trace of this sensitive moment lies in a rather dog eared, terse, and at first glance, potentially dull document which is but one of hundreds of inventories held in the archives of Dijon that describe objects room by room. A household inventory may not seem the best place to start to provide insights into the biographies of people or their objects in the past, and it is right to approach them with caution, given their tendency to omit objects and be based to a certain extent on subjective judgments made by individuals. After all, how much would a modern household inventory really tell us about us or our own homes? A brief description of an armchair and its estimated value, does not necessarily convey the emotional or symbolic value that the chair might have held for a family, as it might omit the crucial information that it was a gift from a much beloved grandfather, and was the very armchair in which the children of a house had been nursed. However, what if we step back from the list of rooms and objects presented in the inventories and consider the dusty document as an autobiographical statement in its own right? By thinking about an inventory as a performative act, it becomes a window onto a bigger historical picture. First, we can use the inventory to reconstruct the ‘theatre’ for the performance. In the case of the Aubert inventory, this ‘theatre’ was both the urban context of the town of Dijon and the Aubert town residence. Today, Burgundy and Dijon are famous for wine and mustard. In the later middle ages, while Dijon exported wine and textiles, the town was important as one of the administrative capitals of the dukes of Burgundy and their state, the Burgundian Netherlands. Created over the period 1384−1477, the Burgundian Netherlands became the most powerful state in Northern Europe, a political, economic and cultural leader that English and French rulers sought to emulate. A good career and living could be made out of working for the Burgundian administrative machine: perks included tax breaks, fiscal bonuses and gifts. 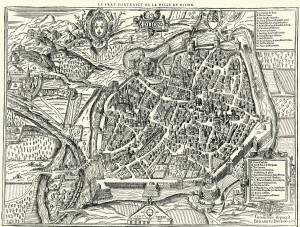 Many individuals connected with the Burgundian household were based in Dijon during the fourteenth and fifteenth centuries. Jean Aubert was one of these men; he eventually carved out an impressive career serving three Burgundian dukes and their duchesses over 40 years. However, his Burgundian career was not unblemished, in 1404 he was suspended for fraud, but he was quickly reinstated after paying back the defrauded money. He like other Dijon elites, may well have lived in the wealthiest parish of the town, by the church of Notre Dame, where impressive stone residences lay just a stone’s throw from the ducal palace−a layout still visible in modern Dijon. Thinking about the urban context and the layout of the Aubert residence, allows us to use the inventory for a second purpose, to reconstruct the ‘actors’ of the performance, here the Aubert family. Although Jean Aubert’s biography can be recreated, several other ‘actors’ remain more elusive. His wife Guillemot, whose death prompted the existence of the inventory in the first place remains in the shadows. We know from the inventory that she was cared for during her final illness by a servant of the house, and several of the objects have a connection to her. Bench covers in the upstairs chamber of the house bear her initials and armorial bearings. The presence of a female servant also reminds us of other ‘actors’, household staff. A wealthy later medieval household would commonly have servants, and if it was the household of a guild master, it could also accommodate apprentices, who would live there for the duration of their apprenticeship. From the well-known actors, to actors who stood in the sidelines, we can then move to consider the ‘audience’. For this inventory, the audience can be reconstructed from the list of the witnesses that are given at the beginning of the document. Four witnesses can be identified. It comes as little surprise that these individuals in part mirror Jean Aubert’s own biography, in that they appear as participants in town government, both as mayors and aldermen, and many also have connections with the Burgundian court. Given their own backgrounds, they must have been unsurprised at the layout and objects present in the Aubert household. Yet, what of the objects listed in inventories? Can they ever be anything more than a static list of items? For the Aubert inventory, if we think of the objects as ‘actors’ in their own right combined with our knowledge of the ‘theatre’, ‘actors’ and ‘audience’ we can establish new insights on the operation of Burgundian state power and the ‘consumer revolution’ of the later middle ages. Chests are but one example of this. Chests now are rather unfashionable, if they appear in a house, they may well act as a coffee table and some useful extra storage−it is unlikely that a modern residence would own or display more than one. However, in the later middle ages they were a staple of house furnishing and storage. Rooms frequently contained multiple chests, in a variety of sizes with or without decoration. They were used functionally, for storage of almost everything we can think of: clothes, jewels, cloths and documents are but some of the items we find listed in chests in inventories. They also appear as plot devices in popular literature of the period. Lovers in Boccaccio’s Decameron could find themselves in the rather undignified position of being concealed in a chest when a suspicious husband returned home earlier than expected. But they, among other objects like textiles, devotional portraits and books are also representative of bigger historical narratives. The first is the growth of the Burgundian State. One of the chests in Jean Aubert’s residence bears the arms of Margaret of Burgundy, wife to Philip the Bold, duke of Burgundy. As researchers we might ‘read’ this chest as purely reflecting Jean Aubert’s career in her household. But if the chest has an agency of its own, it might be also be considered as an ambassador from the Burgundian dynasty, a dynasty that achieved authority and power partly by plugging themselves into town elites through the giving of occasional gifts. Chests recorded in inventories can also help us think further about the ‘consumer revolution’ of the later middle ages. Chests can reveal a changing world, where more products were available than ever before. But with more objects, different choices had to be made about their presentation and storage. Chests concealed and preserved objects that were not for everyday use, they facilitated choices about which textiles were to be used to furnish beds, which cushions were to be used and on what types of furniture and what was to be worn, and when. They, along with other objects in inventories, are a reminder that the purchasing trends and patterns of the ‘consumer’ revolution’ were driven by the desire of these urban individuals to act and perform in an urban theatre and by the ambiguities and uncertainties of their everyday lives and careers. It is in these ways that medieval and modern household inventories can become more than a simple list of objects, instead revealing an ‘urban theatre’. Dr Katherine Anne Wilson is Senior Lecturer in Medieval History at the University of Chester. E. Goffman, The Presentation of Self in Everyday Life (London, 1990). B. Latour, Reassembling the Social. An Introduction to Actor–Network–Theory (Oxford, 2007). This entry was posted in Uncategorised on 21st September 2015 by Grainne Goodwin.